Velvet Paw Creations: "Faera the Tiger Fairy" Fall & Winter Art Card - a Third Coast Creative Coterie project! 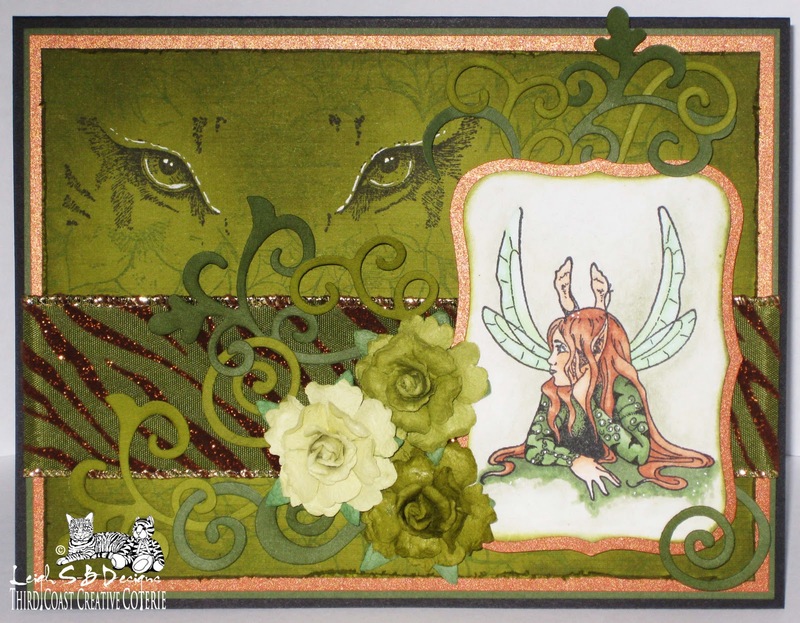 "Faera the Tiger Fairy" Fall & Winter Art Card - a Third Coast Creative Coterie project! Third Coast Rubber Stamps Creative Coterie! The Tiger Fairy is a very rare species but if you time it just right you might be lucky enough to catch a glimpse of one when they come out to play just as Fall turns into Winter! 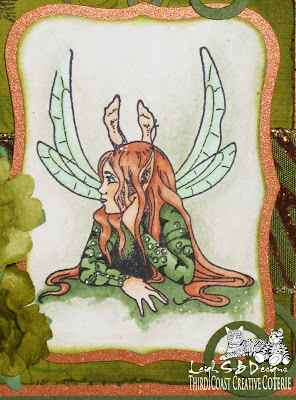 Stamp Fairy Faera onto Neenah Solar White cardstock with Tuxedo Black Memento ink and colour with Copic markers. I used the following Copics: Hair: E11, 13, 15, Skin: E000, 00, 02, Wings: G000, GY11, Clothes: G21, 82 and 85. Add tiger stripes to the fairy's clothing with a black Copic Multiliner. Colour the background with Cedar Green Derwent Watercolour pencil and blend with a Dove Blender pen. Add white highlights with a Gel pen. Die cut the panel with a Spellbinders Label 8 die and apply Peeled Paint Distress Ink to the die cut edge with a Blending tool. Use the same Spellbinder Label 8 die as a template and trace the shape onto copper cardstock, cut out and then adhere the Fairy panel to it with permanent adhesive tape. Cut rectangle mats from olive green, dark lime green and copper cardstock. 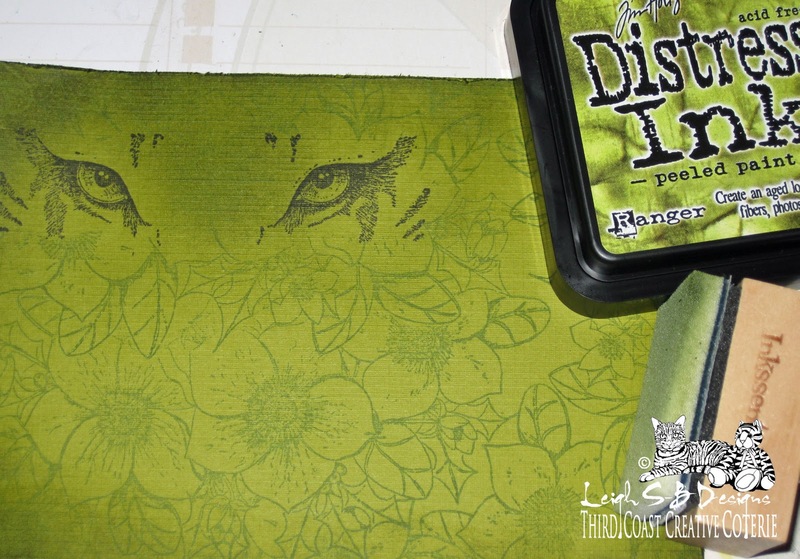 Stamp the Tiger Eyes image with Tuxedo Black Memento ink onto the dark lime green panel and mask the eyes. Stamp the rest of the panel with the Christmas Rose and Holly image multiple times in Ancient Page Leaf Green ink, masking each area before continuing. Distress the edges of the panel with a Distress tool and then apply Peeled Paint Distress ink with a Blending tool. Add highlights to the eyes with a white gel pen to make them really pop. Adhere the Tiger Eyes panel to the copper mat and then to the olive green mat with permanent adhesive tape. Cut a length of the gorgeous Ribbon that has velvety stripes (Michaels) and adhere it to the panel with double-sided tape and secure the ends to the back of the panel with tape too. Adhere the entire layered panel to a black folded card blank. Then adhere the Fairy panel to the front of the card with pop dots. Die cut assorted Sizzix flourishes from the two green cardstocks and distress gently with Peeled Paint Distress Ink. Adhere the flourishes to the card with small dabs of glue. 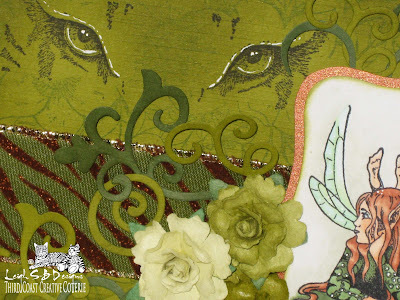 Embellish the card with 3 Recollections paper roses in 3 shades of green. Hi Leigh! Thanks so much for choosing to join us this week at Wags-n-Whiskers. We're so pleased that you are playing along in this challenge, and hope you will continue to join us. We look forward to seeing your beautiful cards. This is lovely, the stamped backing paper is gorgeous. She looks totally Irish, Leigh! I was born on St. Patty's day, and always look for Irish-ish things. :) I just became a follower of yours! Leigh, this card is enchanting! Wonderful card, love the colouring! Today is my birthday and I was delighted to recieve this wonderful card woohoo!